Dave Camp, Mike Williamson, Tom Williamson, Gib Williamson and Wayne Thompson. 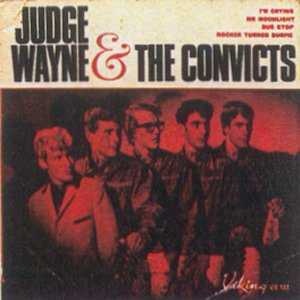 Life for Judge Wayne and the Convicts began under a different name, away from New Zealand, in the early sixties. The Williamson brothers were from Gibraltar, the British colony at the foot of Spain, from where Albert got the handle 'Gib'. They joined the British merchant navy, with an aim of one day, emigrating to Australia. Whilst on their voyagers, by adding a drummer by the name of "Ken", they used to play at their various ports of call. During a visit to Sydney in 1963, they deserted ship and headed to Melbourne, avoiding the Commonwealth police on the way. British beat music was becoming very popular at that time, so with their British heritage to support them, and calling themselves the Steele Brothers, they were soon playing their covers of the Shadows and the Animals around the Melbourne clubs. Ken left them at this time and was replaced with a new drummer called Dave Camp. They were good enough to be picked up by Cottee's soft drinks and sent on a promotional tour right up the eastern seaboard of Australia. They played at dances and for local TV stations along the way. During this promotional tour they added a frontman to the line-up. He was a short Scottish born lad called Wayne Harrison (also known as Wayne Thompson). They also decided that a name change was required, to be more fitting with the times. Judge Wayne and the Convicts is what they came up with, and that was very apt, because the Williamson brothers were still being tracked for jumping ship. Wayne was very popular with the girls, as he used to jump around on stage and go quite wild during performances. The police eventually caught up with the boys and after shipping them back to Sydney to face the music, they were given a warning and allowed to stay in Australia. 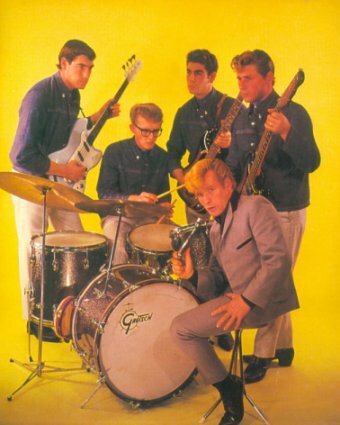 In 1964, Ray Columbus and the Invaders were riding the charts in both New Zealand and Australia with "She's A Mod". When the lads heard this song, they felt that they could do the same, if not better. So beaming with confidence they headed for New Zealand, arriving in 1965. They rented a house in Bayswater, on Auckland's North Shore. The band managed to pick up some gigs at the Surfside in Milford, and also at the Delmonico Coffee Lounge in Devonport. They were also hired for some gigs in Whangarei, but mostly played around Auckland, picking up a regular spot at the Shoreline. The boys also went on a package tour around the North Island as part of the Pretty Things / Sandi Shaw show. Ron Dalton from Viking Records saw them performing at the Surfside and invited them to record some tracks. They did four songs for Viking, a version of the Animals' "I'm Crying", the traditional "Mr Moonlight", the Hollies "Bus Stop" and one of their own "Rocker Turned Surfie". The first two were put on a single and released in 1965, while all four were released on an EP the same year. They also recorded a bunch of rock and roll standards, but these were never released. Immediately after this, things went horribly wrong for the group. One night, Tom, Gib and Dave turned up at the Surfside to play, but couldn't find their gear anywhere. Wayne and Mike had also disappeared. It turns out that Wayne and Mike had sold the gear to pay for fares to go to Australia in order to launch Wayne on a solo career. They had obviously planned the trip in advance, as Wayne recorded two songs on Viking before his departure. They were "Little Miss Rhythm 'n' Blues"/"Here I Am" and released in 1965 as Judge Wayne. That spelt a premature end to the band. Tom, Gib and Dave all moved back to Australia as well, with Gib eventually returning to New Zealand in 1973. All of them maintained an active involvement in the music industry for a little while. Wayne's solo career didn't get past his first song.